As-salamu `alaykum. 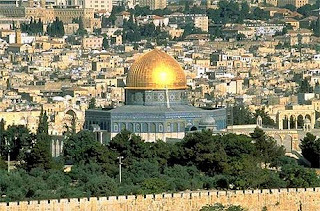 What is the legal ruling concerning giving up Jerusalem with all its Islamic and Christian holy shrines? Would Arabs and Muslims all around the world turn a blind eye to this crime if committed? It is very important to note that the land of Islam is not for sale; it is not to be relinquished, and no damages can possibly make up for its loss. Therefore, it is incumbent on Muslims, wherever they may be, to shoulder their responsibility of defending Jerusalem and Al-Aqsa Mosque. No Muslim, be he in authority or not, is allowed to abandon any of the lands of Muslims. The land of the Islamic world is not the property of any president, prince, minister or group of people. It is not up to anyone therefore to relinquish it under any circumstances. Conversely, it is the duty of individuals and groups to strive hard to liberate occupied territories and retrieve usurped land. The entire nation is jointly responsible for that and it is not up to the ruler or his subjects to choose to give up the land. If a particular generation lapses in idleness or is incapable of shouldering the responsibility, it has no right to force its idleness or incapacity on all the coming generations up till Judgement Day, by giving up what it has no right to. Therefore, I have issued a Fatwa indicating that it is unlawful for all homeless Palestinian refugees to accept damages in return for their lost land, even if they amount to billions. The land of Islam is not for sale; it is not to be relinquished, and no damages can possibly make up for its loss. If this is the ruling concerning any ordinary piece of land in an Islamic state, what will be the case with the holy land of Jerusalem, the land of the first of the two qiblahs and Al-Aqsa Mosque and the third most venerable city in Islam, after Makkah and Madinah? This land was the destination of Al-Israa' and the land from where Al-Mi`raj was launched. Nothing better explains its revered status than Allah's words, (Glory to (Allah) Who did take His servant for a journey by night from the sacred Mosque to the farthest Mosque, whose precincts We did bless, in order that We might show him some of Our Signs: for He is the One Who Heareth and Seeth (all things) ) (Al-Israa' 17:1). Palestine is meaningless with no Aqsa or Jerusalem. Without Jerusalem, it is like a body with no head. Jerusalem is not for the Palestinians only, but for all Muslims, be they Arabs or not. It is a city for all Arabs, be they Muslims or Christians. Therefore it is incumbent on Muslims, wherever they may be, to shoulder their responsibility of defending Jerusalem and Al-Aqsa Mosque. This is an obligation for them all. They are to jointly defend it, offering in the process their lives, their money and all they possess, or else they will be subject to Allah's punishment, for Allah says: (O ye who believe what is the matter with you, that when ye are asked to go forth in the cause of Allah, ye cling heavily to the earth? Do ye prefer the life of this world to the Hereafter? But little is the comfort of this life, as compared with the Hereafter) (At-Tawbah 9:38). We have seen how the Arab world in its entirety was turned upside down when a Jewish fanatic attempted to burn Al-Aqsa Mosque in 1969. Muslims called on each other across the world. The first Islamic Summit was held, which in turn gave rise to the Islamic Conference Organization. When the crusaders formerly occupied Jerusalem, it was liberated by non-Arab Muslims, like Turkish Emad Ed-Din Zinky and his son Nour Ed-Din Mahmoud Eshahid as well as his disciple, Kurdish Saladin Al-Ayoubi, who was able to regain Jerusalem from Christians. Muslims everywhere are still, as they have always been, ready to do all what they can in defense of Jerusalem. This is the case with all the nations I have visited, starting with the Philippines and Indonesia in the very East through Morocco in the Muslim West, though unfortunately this was not the temperament of Muslim rulers. Jerusalem is an invaluable part of the homeland of Islam. For more than 14 centuries, Muslims have lived there. They have not usurped it from the Jews who had already ceased to live there hundreds of years before that. The Jews’ longest reign in Palestine lasted for only several hundred years, while Arabs and others have been there for thousands of years. The Christian patriarch of Jerusalem handed it to `Umar ibn Al Khattab. Among the patriarch's conditions was that no Jew should live there. The sovereignty over Jerusalem, particularly East Jerusalem, must be Islamic, Arab, and Palestinian. This will not prevent any Jew or Christian from observing his religious rituals with the perfect freedom and tolerance which Islam has been famous for throughout the eras. The international legitimacy embodied in the Security Council resolutions assert that Jerusalem is part of the Arab lands occupied since 1967. Hence, evidence based on history, religion and international law all jointly prove that Jerusalem belongs to the Palestinians. The crisis of Jerusalem should be the number one item on the agenda of the Islamic World. Jerusalem is not for the Palestinians only, but for all Muslims, be they Arabs or not. It is a city for all Arabs, be they Muslims or Christians. Therefore it is incumbent on Muslims, wherever they may be, to shoulder their responsibility of defending Jerusalem and Al-Aqsa Mosque. This is an obligation for them all. They are to jointly defend it, offering in the process their lives, their money and all they possess, or else they will be subject to Allah's punishment, for Allah says: (O ye who believe what is the matter with you, that when ye are asked to go forth in the cause of Allah, ye cling heavily to the earth? Do ye prefer the life of this world to the Hereafter? But little is the comfort of this life, as compared with the Hereafter ) (At-Tawbah 9:38).